Mobile Browsing: Does Your Site Embrace It? 38 percent of web users in the U.S. access the web from their phone (or 89 million people). 53 percent of Americans using their phones to go online do so at least once a day. 65 percent of mobile users aged between 18-29 use their phones to go online. 43 percent of mobile users aged between 30-49 use their phones to go online. And these stats are just for American users. 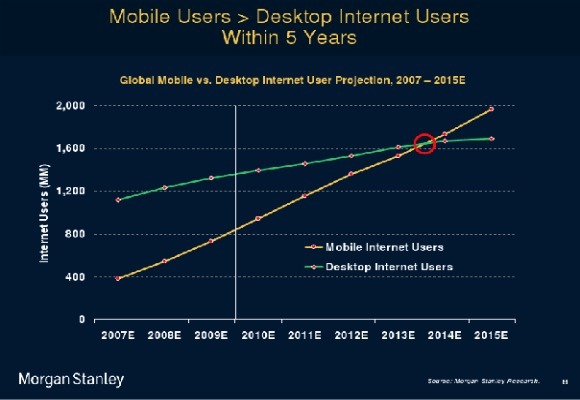 Across the globe, mobile browsing is continuing to grow at a huge rate and, as you can see from the image below, it’s expected to overtake fixed (or desktop) browsing within the next 2-3 years, going by current trends. Which begs the question – is your blog or website mobile-friendly? And if not, how do you make it more mobile-friendly? Depending on who you ask, making a blog or website mobile-friendly is as simple as asking the question, “Can I view it when I open my phone’s browser?” (or tablet, as the likes of the iPad and Playbook continue to grow in popularity). While this might help, it’s not really looking at the bigger picture, and the differing experiences of the various mobile browsers that are in use. Apple uses a different browser than Android, which uses a different browser from BlackBerry, which uses a different browser from HTC, and so on. Then you also have older phones that don’t have the features of a smartphone, and this makes the experience even more different. So to define mobile browsing, let’s work with the meaning of “compatible with as many mobile browsers as possible”. It might look better on some than on others but at least it’s available on more than just the latest smartphones. So now that’s kinda cleared up, how do you make your site or blog mobile-friendly? It depends on the experience you want to offer and how much you want to spend (if anything). The most intensive way to mobilize your site is to give it a full mobile makeover. This can be done yourself (if you know what you’re doing) with some recoding, or by hiring a professional to do the work for you. Depending on how much you want to make your site mobile-friendly and still interactive, the cost can run into several thousands of dollars in some places. With mobile browsing become more popular by the day, it’s a small cost to pay compared to losing readers and customers, no? While the most comprehensive way to mobilize your site is by in-depth optimization, like I say this can be pretty expensive (though definitely worth it for larger sites). For blogs, though, it can be less expensive, because generally most blogs only worry about the post content, and not other sales pages, etc. This means you can choose a simpler option, and there are a ton of these available. Is the Internet Coming to an End? Mobile MAY replace the web, Apps will probably replace software, credit cards will soon be embedded into your cell phone! Folks, the web as we have all known it for years, is rapidly being overtaken by mobile. I believe the web as we know it today, may not even exist 12 to 24 months from now. This IS all happening and there’s nothing any of us can do to stop it, but you can profit from it if you tke your head out of the sand. So where does this leave you? What are you supposed to do with this information? Have you optimized your website or blog for mobile browsing? I’d love your feedback on mobile browsing. Comment by clicking on the cloud button above, or share this post on Facebook and comment there.